If you can keep your kitchen a little bit organized, and manage two or three hot pans at once, the prep for this delicious meal could be quick… Did I just scare you with that? Does your stove even fit two or three pans at once? Have no fear, this is an amazingly delicious meal and it requires just a tiny bit of pre-oven prep for the peppers and the filling. The peppers … Your final product will taste much better if you parboil your peppers first. Parboiling just means drop your cleaned out peppers in boiling water for a few minutes to soften them up. Easy. One big pot of boiling water. 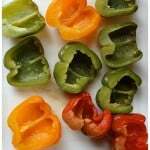 Drain your peppers on a cutting board or even in your casserole pan. Parboiled Peppers … Ready to Be Stuffed! The filling … For this recipe, I combined Italian sausage, chopped tomatoes, cheese, and cooked rice for the filling. If you have leftover cooked rice, you can skip the step of making rice. If not, you will need to make some rice. The Italian sausage and garlic and onions and tomatoes will need to be cooked in another pan. Worst case scenario – three pans. But you totally got this. No big deal. Definitely worth the final product! Why just a half pepper? I have made baked stuffed peppers stuffing an entire pepper but I have realized that a more appropriate serving size for kids and adults is to split the peppers in half. The added bonus of stuffing half peppers instead of full, hollowed out peppers is that there is way more space for the cheesy top layer. More cheese can never be a bad thing, right? Italian sausage, tomatoes, rice, and cheese - can't go wrong with this combination stuffed in a large pepper! Parboil the peppers by coring them, cleaning out the seeds and then dropping them (whole or cut in half) into a large pot of boiling water for about 5 minutes. Let drain. Combine the Italian sausage, onions, and garlic in a heavy bottomed pan. Cook until the Italian sausage is cooked through. Add the chopped tomatoes and marinara sauce to the cooked Italian sausage and cook for about 10 minutes until the tomatoes break down. Stir well. Combine the cooked rice, parmesan cheese, and Italian sausage and tomatoes in one large pot. 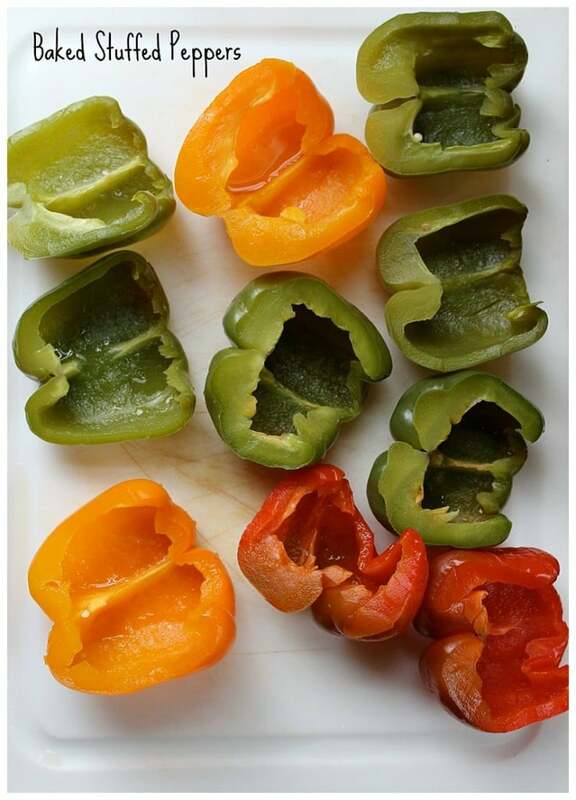 Lay the peppers evenly in a deep 9 x 12 casserole dish. Fill the peppers with Italian sausage. Cook for about 25 minutes at 350 degrees. I love that you used sausage in the filling. Sounds delicious. Thanks! We have a local farmer that makes the BEST sausage. It really tastes amazing in this filling. These look and sound so scrumptious! Really great tip on parboiling the peppers first – that way you can be sure they cook through and don’t result in a big watery mess! Thanks! Parboiling doesn’t take too long at all – it really helps the end result! These look so tasty! I usually just stuff half a pepper or even a quarter of a pepper as well. Makes it so much easier when you’ve got kids. Love your recipe! THanks, Marlynn! I hadn’t thought of QUARTER peppers! My littler ones would probably be in love with that size. 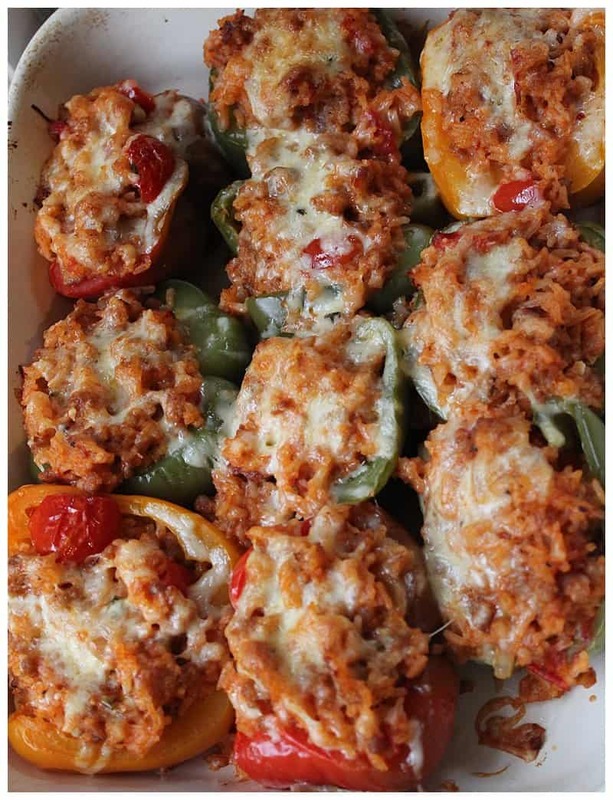 Stuffed peppers are one of my family’s favorite meals and I slice the peppers in half too. Next time I make them, I have to try your recipe. I don’t usually add sausage to mine and I know my family would love that addition. THanks, Joanie! Sausage really adds so much flavor to this simple dish. I hope you try it! Stuffed peppers are a favorite with my family. I agree that half a pepper makes a better “bowl” than a whole one. Your filling sounds wonderful with the tomatoes and sausage!